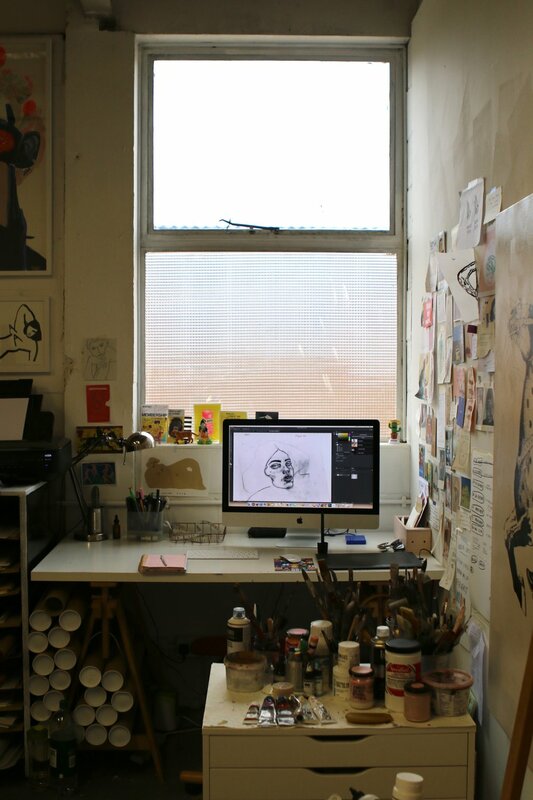 We met with exciting artist Marcelina Amelia to discover what makes her studio so special. Marcelina Amelia is a contemporary artist, working with mixed media approaches to print, painting, and drawing. Amelia draws inspiration from her Polish heritage, looking to religious iconography and folk tales, as well as childhood memories, the power of dreams, sexuality, and the human condition. Her work plays at the tense borders between lust and innocence, creating an uneasy aesthetic that is delightfully difficult to pin down. Looking to the triangular relationship between cities, the natural world, and human involvement, Amelia’s work is saturated with contemplation and profundity, which is expressed in the beauty of her aesthetic. She has been featured in publications including Booooooom, Bomb, Art Maze, Create, Digital Arts, Vogue, and more and has exhibited her work internationally. Extension of my brain, soul, imagination. Home. I started "art-making" when I was only 3-4 years old, and I always had to build some sort of a “Marcelina's shrine” above my desk/bed, it would usually consist of scraps of paper, postcards with work by my favourite artists, colour swatches etc. I kept this technique of visual mapping till this day. It changed throughout the years but I do remember my first inspiration wall, it consisted of Michael Jackson posters, Disney stickers and drawings of playful elephants. Right now my studio is exactly that, a space with walls covered in my thoughts, inspirations and art. I'm like a sponge. I think my environment I and my work are one. It all feeds off each other. I was always hugely inspired by my surroundings, people and their moods, feelings. I think that capturing that combined energy is probably one of my main goals and themes in my work. I think space, where you create, is so important, I’m a little bit of a interior geek too, in my free time I like creating Pinterest mood boards with my dream spaces. Looking at pictures of nicely designed houses calms me down. I think it should reflect the personality of the studio owner. Some people love minimalism and simplicity, for me personally, I like my space to be visually stimulating, orderly chaotic. I like to work on numerous artworks at the same time too, and I usually stick my reference images and inspirations around the piece I’m working on. But generally, I would say white walls, high ceilings, some natural light and a dirty concrete floor equals a good studio base for me. It is important to feel free in the studio, so anything that is too clean or too perfect scares me off.